Am I hearing right that it's saying "it will remain the same as it I.S.A. sit is", ignoring the word and line divisions on "is / as it"? How bizarre. As long as there's a Google Translate, it will continue doggedly, robotically to try its best to make sense of nonsense (and, of course, of sense, and of everything between sense and nonsense). That's its job, its duty. That's what it was built for. That's its raison d'être. 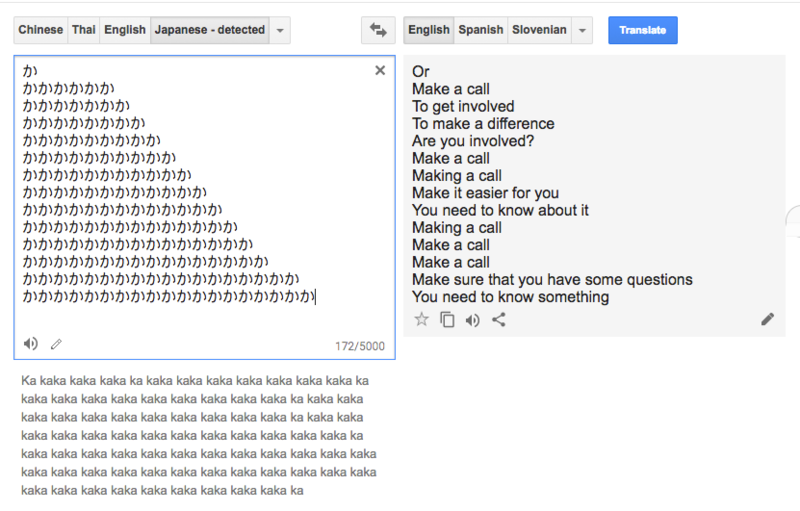 By its very nature, Google Translate will obediently deal with whatever is thrown at it. [(myl) The displayed behavior is a feature of some MT methods and not others. And programs for analyzing user feedback are quite good at detecting various forms of "keyboard banging". the people that are so close! the people that are so close to the people! how hard they are at the same time? the more common of those who are so close! more widely used by people? If an intelligent human being is asked to translate nonsense / gibberish, they will most likely reject the job. If an intelligent human being is forced to translate nonsense / gibberish, they will simply transcribe or transliterate it into the script of the target language. [(myl) And it would be very easy to program an MT system to do either or both of those things — to remark that the input seems to be character-repetition or random sequences of character fragments, and/or to propose a translation that roughly replicates the input. I was having a go at this yesterday, and it struck me that this is similar to the LSD-like images demonstrated by Google’s Deep Dreams. My understanding, assuming that this is the result for an artificial neural network, is that certain patterns are embedded in the parameters (the weights) that act as transmitters between units (nodes, neurons) in the neural network – the model creating these. Where the visual network of Deep Dreams may insert its impressions of dogs or cars into an image, the model in this instance conjures up common phrases in response to certain stimuli. Another fun thing to do is to find a video of a Korean talk show on YouTube and turn on machine transcription and translation. This tends to generate discussions relating to fiscal policy, elections, business and medicine, which of course simply reflects the material the model is trained on. I await word of my NEA grant; also, the appearance of "Stay free to leave" on New Hampshire's license plates. I do not know what to do. I do not know. I do not know. I do not know. I do not know. @Victor Mair: Making sense of nonsense is not its job. Its job is to advertise Google's paid service, with which "websites and applications can integrate with Translation API for fast, dynamic translation". Sounds like their market is vendors who want their online catalogs to be updated automatically. The selling points are *fast and dynamic*, not *guaranteed correct*, and implicitly it's meant for interactive use where if the seller's offer comes out gibberish, you have a chance to go around again. I don't think anyone's mentioned yet that if you hover the mouse and "click to edit and see alternate translations" you get a more literal translation which is ungrammatical garbage, instead of hallucinatory poetry. 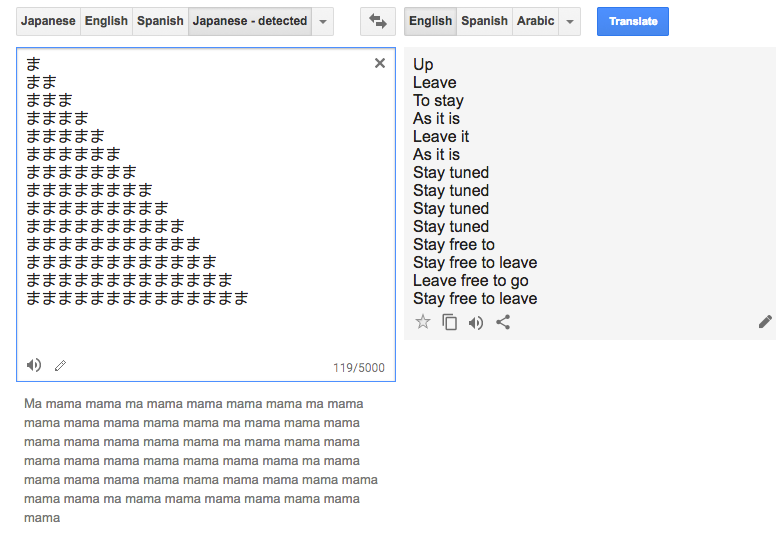 Thus the last line of the last Japanese example becomes "Mamagamama but leave Mom is Mom is Mom Mom Mom Mom Mom Mom Mom". These hallucinatory outputs are alluring because they invite experimentation, trying to figure out the black box and control it, yet it continues to generate surprises. Plus, it raises the question: *why* do these accidents feel poetic? 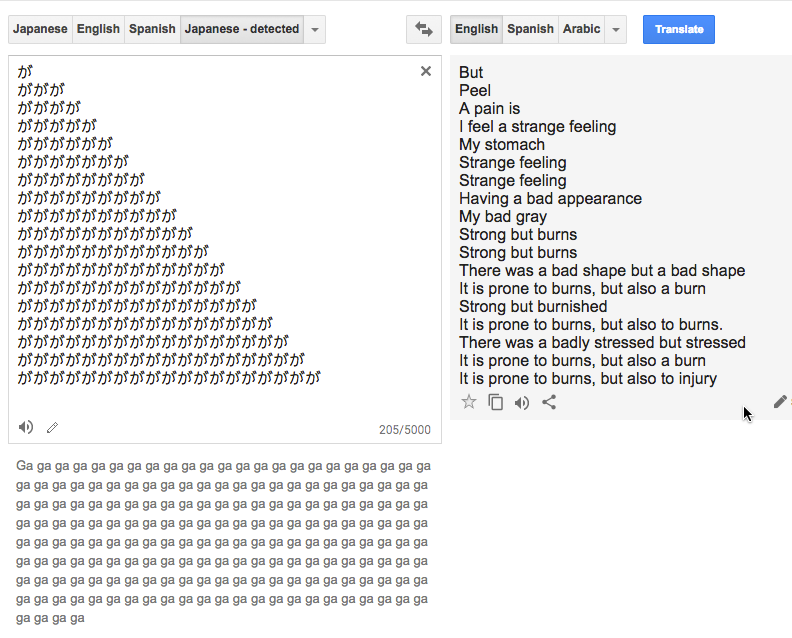 The English translations seem to have a lot of alliteration (strange… stomach… strong… shape… stressed). I wonder if its corpus mixes vocabulary lists with connected text, so it thinks that words that are close alphabetically should appear together. GH, I think it's saying "… I.S. / A's it …" — that is, the abbreviation for the Islamic State, followed by the plural of the letter A. @myl (replying to Victor Mair) "The reasons that this doesn't happen in current Google Translate (and in some other systems) involve an interesting story about the machine-learning methods involved…"
I, for one, would indeed be interested in that story. Wow, I think their poetry skills have improved considerably. There are actually doable for singing. These menus are from (detected) Estonian. It is not poetry, but " Noun" and " Etymology" suggest that the training set includes some linguistics webpages… Or what does it suggest? The  part makes me think it comes from a wiki, either Wiktionary or Wikipedia. I was inspired by this google spoken word poetry going around and incorporated it into some of my artist books. I made a volume for Thai, Japanese and Greek. I was trying to uncover the range of source documents for the algorithm. Most of the inputs I used were nonsense, but it was intriguing to compare the type of text returned. For instance compared to this poetic example from your post, Greek text returns chemical compounds and business documents – mostly related to UN documents it seems. Titles: The Unfolded Folded (Thai), Starting with the Beginning (Greek), Please Wait for the Showdown (Japanese).